24 is a honest attempt to offer a different film for the audience. An experienced director like Shankar would have made wonders but then the film is still a good watch for that brilliant moments. 24 also leaves unanswered questions. Why did Athreya want the time travel device initially? What made him evil? What happens to the ‘present’ characters had time travel not changed their fate? Vikram wants you to trust in the time travel and forgo the present. The biggest leap of faith happens towards the end when Vikram compels the audience to give in to the possibility of a different version of the tale. This is a film that merits a discussion after viewing and that’s not a bad thing. How often do we get such films? Vikram Kumar who captured the imagination of all with Manam,came with sci fi thriller 24. First half starts with interesting introduction and then weaves a web of romance and love on everyone. Interesting twists and turns keep the pace of the film. Interval bang is good but second half drags with sentiment and family scenes. Story picks up pace at the pre climax and climax. 24 is surely one of the most technically brilliant films that has come out in the recent past. 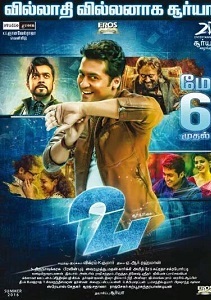 Suriya’s spell binding triple role, racy thrills and engaging concept will impress you big time. This film will take Suriya’s stardom to the top level and proves that whenever he does something different, it is bound to attract everyone. Finally, if you keep your expectations in check and bear the lack luster love track, 24 will entertain you completely. The movie has its flaws, and we can also say the movie has shades from various Hollywood movies, but still this one is a 'Welcome' note to Tamil cinema. ’24’ movie has very engaging script on paper but after converting it to a full length cinema and due to insertion of Surya-Samantha love track and other filler elements, the main plot got diluted and overall movie pace has slowed down considerably., Few scenes at the beginning are extraordinary. “24” is the output of Suriya’s new angle and Director’s high level work on par with Hollywood standards. The audience really experience a great thrilling feeling after watching the film. or all those novelty loving cinema audience complaining on creative deficiency levels among South directors and writers, Vikram Kumar is the only answer. His brain is surely a special device familiar for playing with time. Vikram is an amazing technician with Indian intelligence. Like scientific concepts in Hollywood always confuse the audience, Vikram has put forward a theme, simple to understand and easy to accept. A sci-fi thriller that'll amaze you. A sci-fi with family sentiment thrown in. Gripping screenplay. The rom-com overstaying its welcome is a flaw that can be forgiven. Technically brilliant. At least four intelligent episodes will make you want to clap. it is not often that we see a big star choosing to take a risk with a script that is not simplistic or formulaic, especially when his last few films have underperformed at the box office, but here Suriya pulls it off admirably. : It’s very risky for any actor or producer to trust such a novel theme and invest heavily on it. Suriya should be appreciated not just for doing great performance in multi-dimensional roles, but also for being one of the producers. Vikram K Kumar made sure that he narrated the film in such a way that it can be easily understood. But, there is a possibility for some of the audiences to think that scenes are repetitive. Plus points of the film are novel theme, Suriya’s performance, cinematography, visual effects and screenplay. On the flipside, slow narration and excessive runtime might affect the movie. Finally, 24 has its brilliant moments but there are many flaws as well. Firstly it is not a Sci-Fi film, it is a family drama with Time Travel concept. We will enjoy the film as long as Athreya is on screen but the remaining is boring. Having said that you can watch it once to encourage the different attempt and enjoy those brilliant moments. All in all, the “Manam” director has once again come up with a film with a different concept though not completely convincing. It works intermittently. Should appreciate Suriya and the director for attempting a novel movie. Although 24 has limited appeal and has its minuses it is one of the best movies in recent times. We won't get to see such ideas being executed by our filmmakers where the majority of audience loves to watch the masala stuff. Vikram Kumar needs a pat on the back for exploring something unusual and Suriya should be lauded for backing such an innovative idea. 24 is a must watch for audience that are craving something different in an Indian film. Suriya's sci fi fantasy thriller has all the ingredients to keep you HOOKED!